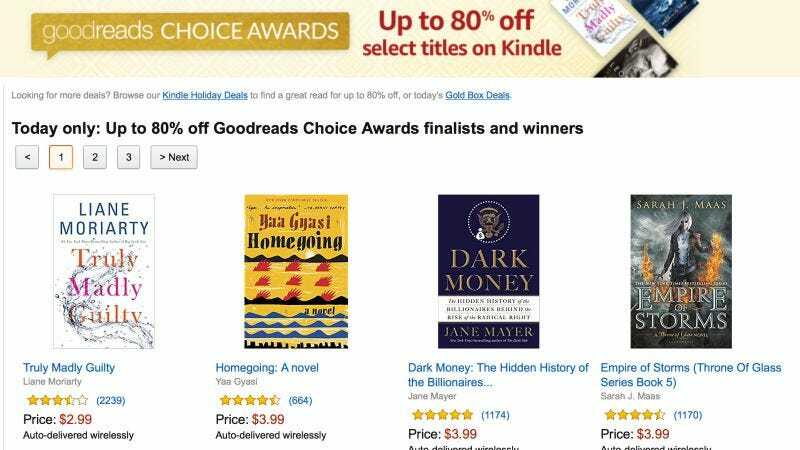 A lot of people must have unwrapped Kindles on Christmas, because Amazon’s running a huge ebook sale for the third straight day. Today, the theme is Goodreads Choice Awards finalists and winners, and some highlights include Rise of the Rocket Girls, a biography of Leonard Nimoy written by William Shatner, and Dark Money: The Hidden History of the Billionaires Behind the Rise of the Radical Right. There are three pages of titles available though, so head over to Amazon to see them all. If you missed out on Black Friday TV deals, this 65” 4K Samsung is back on sale for the same price you would have seen a month ago. I have the 55” version of this set, and absolutely love it. If you’ve been meaning to wall-mount your TV, this highly-rated Cheetah mount will only set you back $18 today with promo code 667ERJQA. This particular model doesn’t articulate left and right, but it can hold TVs anywhere from 20” to 70”, so it should be sufficient for most of you. About a month ago, Amazon launched a new shock and water-resistant AmazonBasics Bluetooth speaker, and now you can get it for an all-time low $28. PS4 and Xbox One owners can book their ticket back to Skyrim for $30 today, complete with all of its DLC, and even mods. It was briefly available for $25 on Black Friday, but this is still a great price considering it’s less than two months old. For the rest of Tuesday’s best deals, be sure to head over to Kinja Deals.